HG612 Modem Stats only works if you have an unlocked HG612 FTTC modem. Please check the Router Monitoring Forum for details & news of the latest version. HG612 Modem Stats v 2.0 can be downloaded from here. You can put it elsewhere as long as you change the directory paths, which we will cover later. 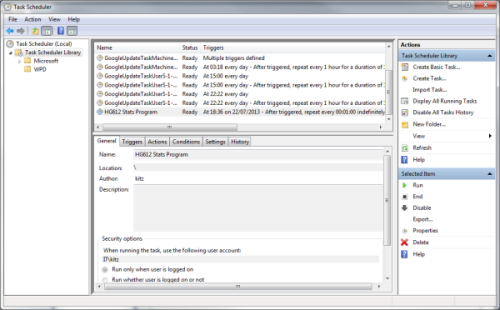 HG612 Stats logging GUI is a program for Windows that allows easy configuration of the HG612 stats logging scripts and sets them to run as an automated task. This should be in the "Scripts" Folder. If you are using the default C:\ location you should not have to do anything here and you can move on to the next step of setting a scheduled Task. OR if like me, you placed the folder elsewhere then you will be presented with a screen which has yellow highlighting advising you that the required folders do not exist. Simply click on the "Browse" buttons and navigate to the correct locations. 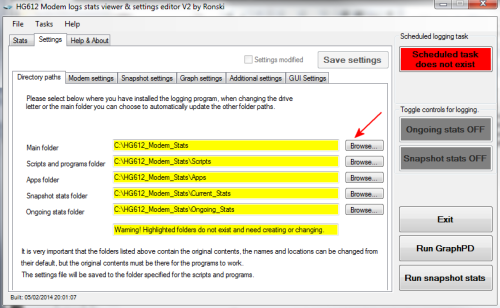 Once you have selected the main folder location a pop-up window will offer you the option to update the remaining folders. This should now set the correct paths for the remaining folders. 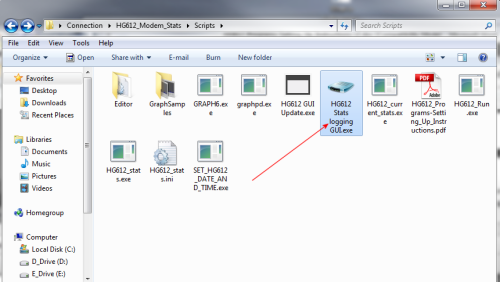 *Please note: Although you can rename the HG612_Modem_Stats folder and/or change its location, you should not move or change any of the contents within the sub folders. 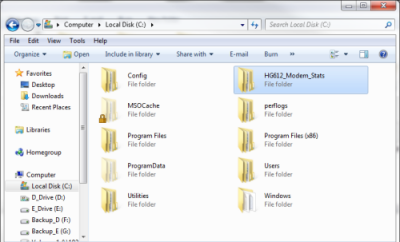 Click the "Save Settings" button at the top right to confirm and save the directory Paths. 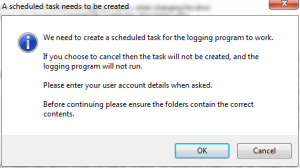 Alternatively click the red "Scheduled task does not exist button" at the top right. The Settings Editor will guide you through the process of creating a Windows Scheduled Task so the scripts will run automatically. When you're done you will be advised that the task was successfully created and the buttons at the top right of the Settings Editor should turn Green. 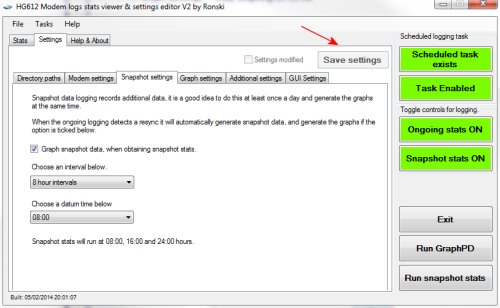 The settings editor offers various options for graphing. Remember to click the Save button after making any changes. Run GraphPD - Generates graphs over a period of time from the Ongoing Stats. Various time options are available so you can plot graphs over 'x' number of days. This can be useful for monitoring and creating a montage of longer term statistics. Run snapshot stats - Generates graphs and pbParams of you current line stats. 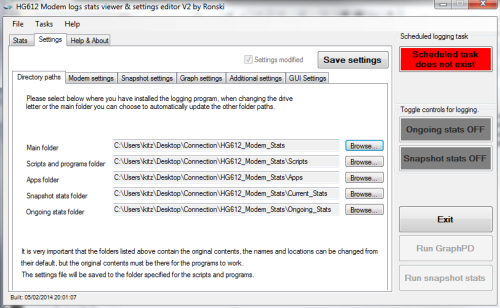 Click the "Task Scheduler Library" folder (not Local) and look for "HG612 Stats Program"
Detailed HG612 Modem Stats configuration - See the .pdf file HG612_Programs -Setting_Up_Instructions which can be found in the Scripts folder. HG612_Modem_Stats is a community based program under the wings of Bald_Eagle1. 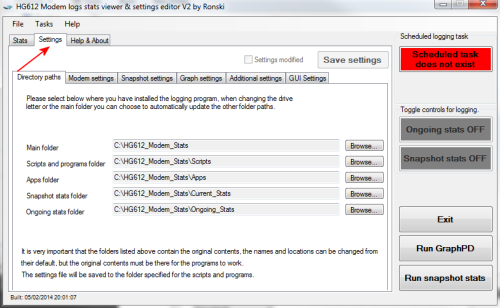 The GUI editor was written by Ronski. If you need help or want more information then please ask on the forum.